Have you ever heard your mom saying not to sit close to TV screen because it could hurt your eyes? You might not have paid attention then, but she was right. Every person in this modern age is connected. Kids between the ages of 8-18 years spend 7 to 8 hours in front of the screen. When talking about the modern workplaces, nothing is done without computers. Not to forget the screens at your home. Do your eyes feel tired and hurt after this exposure to digital screens? 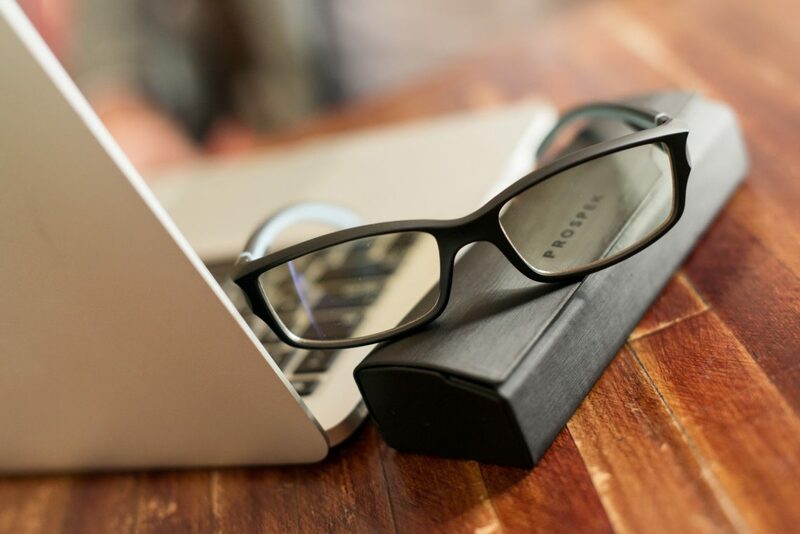 Extended hours in front of the screen can cause vision issues such as Computer or PC Vision Syndrome. Are you looking for something that can help? Here is the deal. Fortunately, we are living in the age where there is a solution to every problem. Computer eyewear can help you prevent digital eye strain. With computer glasses on, digital screens become safe for your eyes. Read on to know how these glasses can be helpful. There are many factors that result in eye strain such as prolonged use of digital devices with screens just a few inches near your eyes. Moreover, there is an emission of blue light from screens that makes it difficult for your eyes to focus. You would have to refocus to keep working. To prevent your eye from getting hurt, computer glasses have been designed. You are probably wondering: “What is so special about these glasses?”. This pair of glasses filters out those blue lights releasing from your computer screens. Theis specially-coated eyewear is designed in a way which aids your vision when you’re glaring at the screen. These are special-purpose eyeglasses which claim to optimize your vision when you spend long hours near digital screens. It helps to reduce the major causes of eye strain. They ease glare, enhance contrast, and maximize images. You can spend extended hours without hazards by seeing through these lenses. Two main features of these glasses are anti-reflecting coating and color tint. This is a coating on the outer side of the lens, which reduces glare coming from the screen and other ambient light sources. The manufacturers like Gunner and VC offer this coating in gaming and PC glasses. You must be thinking, what if you already wear prescription glasses? Good news is, anti-reflective coatings can be put on your prescription glasses as well. What could be better than this? Nevertheless, not all these anti-reflecting coatings provide effective results. It depends on the quality. A cheap coating claiming to be the perfect one isn’t a good deal. It may look attractive but do not play fool here. They can even worsen the vision. These coatings have come a long way over these years. Thus, you would find both new and old ones. Newer ones are more advanced and work better. Computer vision consultants emphasize on the latest coating. So, always ask for the latest one. She recommends Crizal Sapphire UV AR coating to her patients. Some glasses eyewear come with a yellow tint. It is designed to enhance the contrast on the screen of your phone or laptop. Furthermore, it keeps your eyes from the harsh light spectrum. It also relaxes your muscles. Do you want to have tint other than yellow? Yellow glasses are signatures of some brand nut you can get other colors as well. Also, the tint can be applied to other glasses. The lens used in computer eyewear is particularly designed to work well near a computer. Also, these lenses are only prescribed for digital screens and you cannot wear then for general purpose. A simple computer glasses pair features single vision lenses with modified lens power. It enables the person having a comfortable vision. It gives the largest field of view makes it easy to focus. Single vision computer glasses aids in getting rid of eye strain, blurred vision and unnatural poses that result in neck and back pains. Some computer glasses offer occupational progressive lenses, which correct near distance vision and provide more comfortable vision on the computer. These lenses are not suitable for distance vision tasks such as driving. These lenses cover larger zones for intermediate and near image that you can customize according to the needs. Consult your optometrist before you choose any of the above lenses. Some people are just fine with eye strains. They embrace them and do not bother to do anything about that. This is not a wise idea, at least not recommended by an eye doctor. Eyeglasses keep the blue light emitting from your computer away from your eyes which is the main cause of eye strain. Those eyeglasses with high-quality anti-reflective coating give a clear vision and keep the dust and fingerprints from appearing on the lenses. Some computer eyewear comes with a small bump that makes the print on screen look larger. It is a good way to reduce eye strain. Computer glasses increase contrast so that it is easy for you to focus on the screen. It is easier to focus when you see an object close to your face. We see the clear and sharp image when eye’s muscles adjust the curve of the lens in your eyes. When the object is 4-10 inch away, the muscles contract easily. Your eyes don’t have to struggle to focus. On the other hand, when we talk about the objects farther away, the eye muscles relax and let you look at the distant image without strain. It allows adults to see the object clearly at the distance of 31.5 inches. 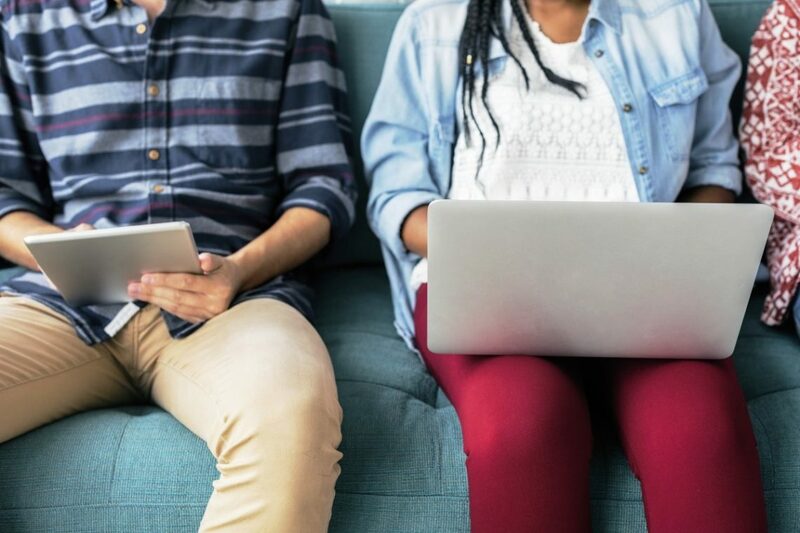 When we sit in front of computer screens, the distance from your eyes is usually 15-20 inches. At this distance, the eye needs to focus and refocus constantly to see the screen clearly. This struggle of your eyes results and headache and migraines. Even the individuals with 20/20 vision can have this type of complaints. When you have your computer glasses on, you can focus on the image on screen without strain. These glasses have a multifocal lens which makes the computer screens look like reading paper. You wouldn’t have to stare. Do not mix the reading glasses with computer glasses. Reading glasses let you see the close objects while computer glasses are for up-close distances i.e. a few inches from your face. 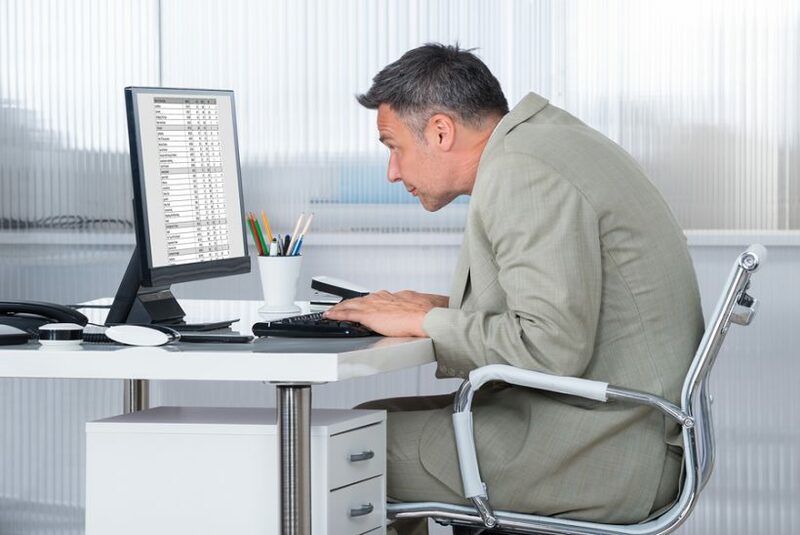 Your computer screens are likely to sit at the point where you have to move closer or lean forward in order to get the clear image. You have to set yourself in an unnatural posture. Adopting these positions can cause tension in your neck and shoulder. Moreover, it can bend your spine which has to be attended immediately. With computer glasses on, you wouldn’t have adopted different positions to focus on the screen. Can you keep on working for unlimited hours with light bouncing off your screens and causing your eyes hurt? You need frequent breaks to give your eyes some rest. Headaches and back pain also take over when you don’t take rest. Anti-reflecting coating and tint of computer glasses reduce the reflection on your lenses and eliminate strain. Most doctors recommend yellow tint as it lessens the effect of blue light releasing from the computer. Check out our article about how does computer eye strain affect your productivity. You must be wondering: “Do eyeglasses work as perfectly as it seems on paper or in an article? 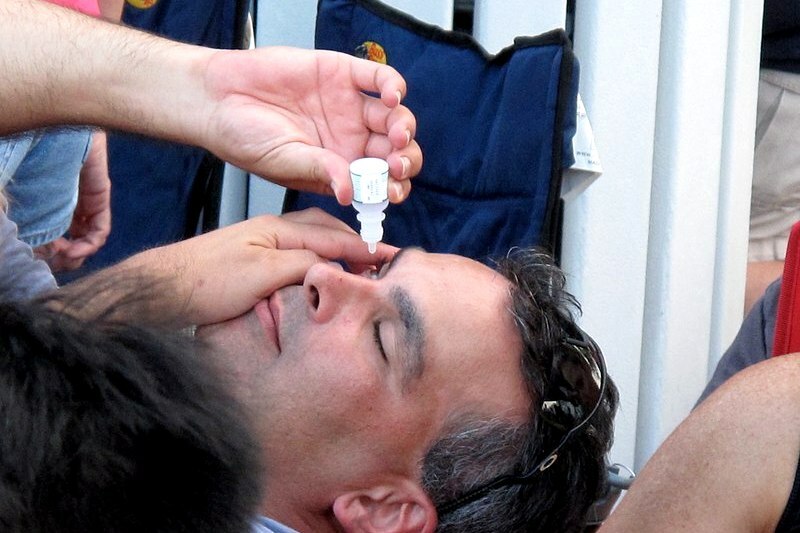 Is it really a quick way to get rid of eye strains?”. The answer is, yes! They are a great solution unless you go to a cheap shop and get a pair for yourself. How effective the glasses are going to depend on the quality. The effectiveness can vary in a different situation and it also depends on your viewing habits. There is a top-notch brand out there which has beautiful and trendy frames to offer with the lenses that give protection to your eyes – SPEKTRUM. They are so lightweight that you would not even feel like you are wearing them. How Are Computer Glasses Different From Conventional Glasses? Are you one of them who think wearing conventional glasses is same as wearing computer glasses? They both have different features. Computer glasses make the computer screens better for your eyes. It enhances the quality of the image on the screen. Computer glasses may give different types of coatings depending on purpose manufacturer. The most common coating used in these glasses is an anti-reflecting coating which keeps your eyes from hurting. Where To Buy Computer Glasses? Always void buying over-the-counter reading glasses. They look attractive but you have to have accurate eyeglasses prescription in order to take full advantage of computer glasses. Prefer making your purchase from an eye care professional. Tip: take some measurements before eye exams such as the distance between your eyes and screen when you work. It would help the eye doctor to determine the optimum lens power for your eyewear. Check our guide “Prescription For Computer Glasses: How to Get The Right Pair“. Who Should Not Use Computer Glasses? You might have heard the quote, ‘if it ain’t broke, don’t fix it. You can apply it here as well. These special-purpose glasses would do nothing to you if you are not suffering from any eye problem. In fact, they can cause hindrance in an already optimized environment. When your vision is already clear, the frames would limit it and lenses get smudged too which can blur the vision instead of correcting it. Why should you take other measures when eyeglasses are providing the solution? This is what you are thinking? The hazards of sitting on front screens for long hours do not only include eye strain but also causes headaches and neck and shoulder pain. No doubt eyeglasses protect your eyes, yet it is not healthy to stick to the computers. Give protection to yourself with these following tricks. Set your computer in a way that you are gazing a little downward and keep the screen at least 25 inches away. Matte screen filters can reduce the glare of computer screen. Have it on your computer. The 20-20-20 rule: take breaks using this rule. Look at another object that is 20 feet away for 20 seconds after every 20 minutes. Your eyes usually get dried after facing computer screen all day long. Refresh your eyes by using artificial tears. Adjust the lighting in your room and increase the contrast on the computer to reduce the glare. If you wear lenses regularly, take them off for some time to relax your eyes. To see more tips check out this article. This is true that you can’t say goodbye to digital screens. However, you should go easy on your eyes. You put your vision at stake by not paying attention to computer eye strain. Why overlook the solutions when you can actually save your eyes from hazards caused by the digital screen? Is it too difficult to wear computer glasses? They would do nothing but enhance the vision on screen, make easy to focus, and prevent your eyes from getting hurt. Follow all necessary measures to keep your vision light. Nobody likes to see things blur!